Store up to 1000 bottles of wine in a temperature controlled, underfloor wine cellar. Save space and keep your wine at the right temperature with our glass wine cellars. From a visual point of view alone, a glass wine cellar designed and fitted by Finepoint will look stunning. At the same time, a glass wine cellar will save space – meaning you’ll have space to include other essential items. 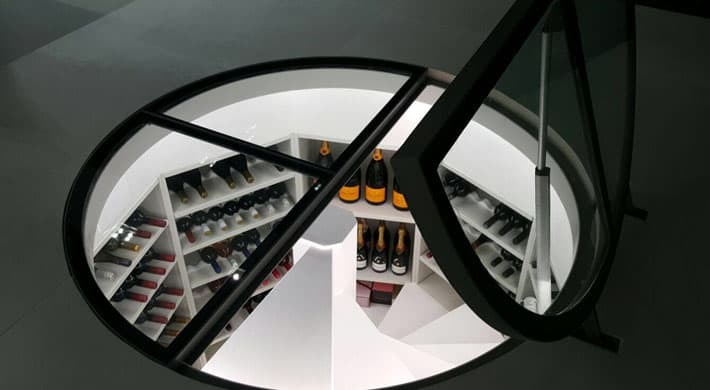 The glass wine cellar is becoming an increasingly popular choice for homeowners – not just in London where Finepoint is based, but throughout the UK. Perhaps that’s because it puts a unique spin on an established idea. Keep your collection the perfect temperature – and make the most of the room you have available – by asking us to design your glass wine cellar. Call us now on 01923 229 949 or use our contact form to send a message. The customers we work with in London and UK-wide don’t always have a dedicated basement in which to fit a glass wine cellar. Using our experience, we can find a suitable location for housing your collection. Your bespoke wine cellar could be housed in an unused underfloor area of your home or work as a focal point in a more visible area. When you contact us, we’ll be able to use examples of projects we’ve worked on to inspire you. To get started, all you need to do is send us your measurements and images. Even without this, we can help. If you want to see a glass wine cellar, visit our showroom. We’re based in London, but cover the entire UK. 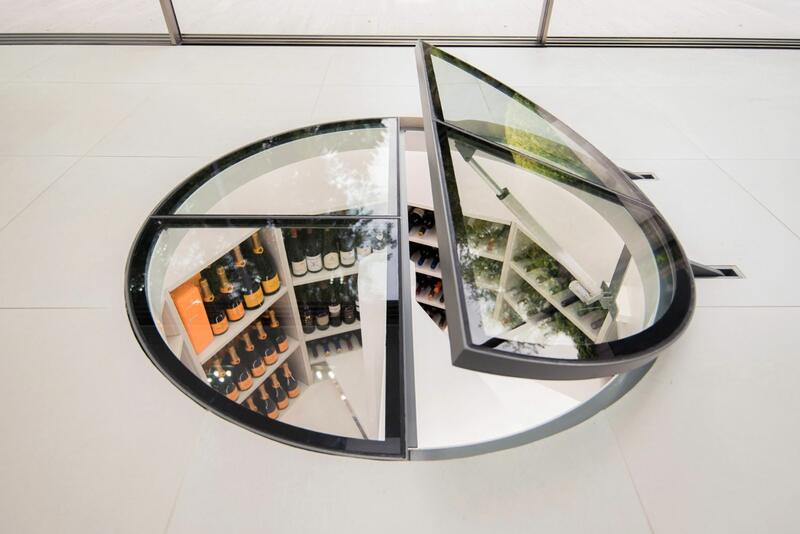 We will tailor the design of your glass wine cellar, so that it harmonises with the themes and schemes of your home. We will create your product by consulting with you, while bearing in mind the importance of storage conditions. If you want to showcase your vintage collection, but protect it from deterioration, an enclosed glass wine cellar is best. We can even provide secured lockers if you want to protect your items in the event of an attempted break-in. Other variations of glass wine cellar are available too. Case storage and high reveal displays are just two of options we’re able to offer. Find out more about our bespoke design service for London and UK customers by contacting us. Although a glass wine cellar will act as a wonderful focal point within your home, it will also serve a more practical purpose: to protect your collection. That’s why it’s important to use the right depth of glass during the installation. Finepoint will safeguard your collection by using glass of the right thickness, so that the correct balance between refrigeration and humidification is struck. This means your valuable possessions won’t unnecessarily degrade. In addition to using the right thickness of glass, we will take care with the joins so that there are no breaks in the installation. Wherever you’re based in London or the UK, call our expert team for advice and glass wine cellar prices. When you choose Finepoint to design and build your glass wine cellar, you’ll be buying a product with a difference. Our precision detailed powered walk on glass top rises at the touch of a button to give access to a spiral staircase and integrated wine racks. This means that your glass wine cellar will be visible and easy accessible, but without taking up space in your home – an important consideration if you have limited room available. Whatever the size of your property, Finepoint will be able to help you. The contemporary appearance of your brand-new glass wine cellar will act as a talking point for family and visitors, while at the same time rewarding you with a niche space in which to store your valuable collection – quickly and at the touch of a button. The customers we work with in London and other areas of the UK love the storage capability of their installations. A glass wine cellar can house up to 1000 bottles in an environment that’s concealed, and temperature controlled. 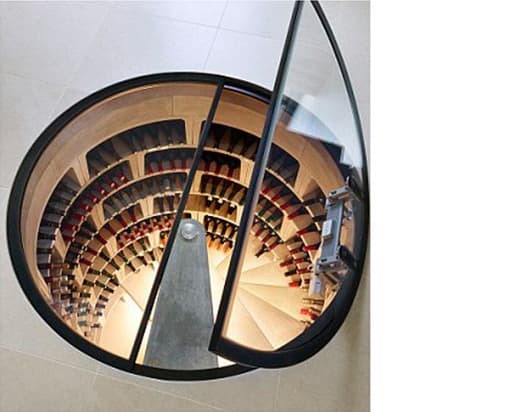 Save valuable space and add a unique design twist to your home with a bespoke glass wine cellar. Its contemporary appearance is bound to delight you, while adding market-value and appeal to your home. To get help designing your new glass wine cellar, call our expert team on 01923 229 949 or send us a message to request a call back. Examples of our work can be viewed at our showroom in London. Wherever you live in the UK, please use our booking form to make an appointment to view our products in person.